i love colours and i love sweet stuffs. 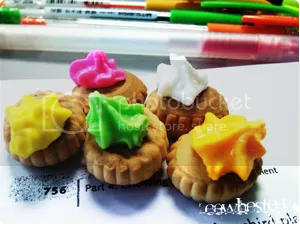 pretty and yummy biscuits were the lunch snack during mugging times with buddy today. anyways, i can’t figure what’s wrong with me this semester. the motivation to get up early, chop a good table to mug mug mug till the sun sets isn’t there anymore; the drive to write my own tidy colourful notes each time exams are near isn’t there anymore too. i just feel so screwed for almost ALL the modules this semester. but well, as if it helps, the desire to maintain my GPA is still there. hahah..
spent an hour and a half on Channel 5 earlier on. i guess the advertising for the above shows done on Class 95FM was attractive enough to get me sitting in front of the TV. well, if you know me, you’d know that i seldom watch TV these days (except for 百万大歌星 every Sunday) because my life revolves around my laptop. hahah. 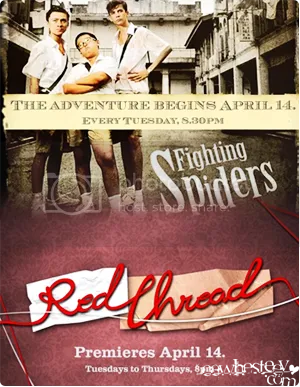 anyways, Red Thread was not too bad a catch but Fighting Spider was so-so only. maybe spending one hour is just too much a commitment. 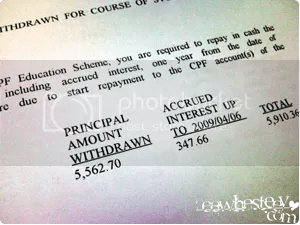 on a side note, received the letter from the CPF board regarding the repayment of my NP school fees to daddy. guess he was as clueless as me on this dumb Education Scheme. i do know i have to return him the sum of money when i graduate but i didn’t know it will be in THIS way. i thought it’d be deducted from my CPF account when i start working instead of in cash, back into his CPF account. in this case, we might as well just pay the school fees in cash like 3 years back since it makes no difference. even daddy thinks it’s stupid cos he didn’t think he wants/needs those money back in his CPF also..
Hi Tse Hwee, your dad can choose to opt out of the payment scheme. Means he choose to bare the fees and not take from u. I think just need to send a letter to CPF. Then, you can pay him back in cash. It happens to my bf. But his dad did not opt out. Cos the longer my bf delay paying, the more interest he gets in his CPF account. Haha. He dragged about for lik 5 yrs (2yr army + 3yr uni). On a bright side, when u work next time, ur employer also contributes to ur CPF so in another way, ur employer is also paying for ur education. Hehez. Yes, it is seriously dumb, pay in cash now still incur interested, must well pay in the past. exactly! i was thinking in this case, really should just pay cash in the past. not like we cannot afford. lols. hahah really? how come sia.. maybe i go attachment then sch fees lower? lol! HAHA. seriously, there’s no way i can answer that question also! maybe someone saw that i was quite poor, so they helped me cut down the fees? heh.